The Henry Scripps Booth Collection of Menus is a fascinating glimpse into another era and the travel exploits of the leisure class. The Cranbrook Archives has digitized a portion of the collection, mainly menu covers, that can be viewed in our digital database. Menus are wonderful cultural documents that reveal economic, dietary, artistic, sometimes geographic and even literary information about an era. Many of the menu covers have artistic renderings, some of them signed. 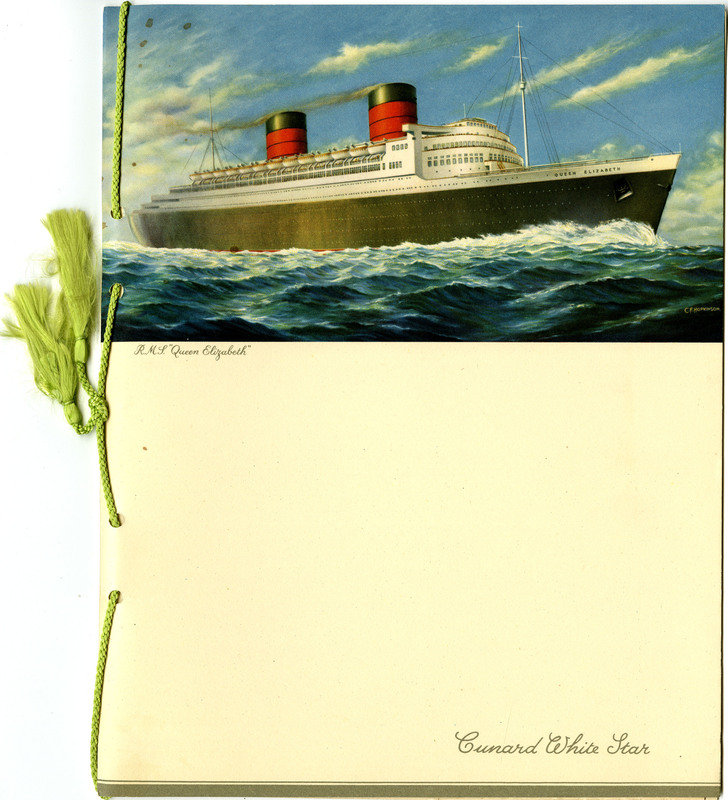 The 1952 menu for the farewell dinner on the Queen Elizabeth has a reproduction of a painting of the ship, with the name “C.F. Hopkinson” visible in the lower right corner. Farewell Dinner Menu for R.M.S. Queen Elizabeth. Doing a Google search, I found Hopkinson’s name in a blog post, written by the archivist in charge of the Cunard Archives (imagine what a fascinating archive that must be) in the Special Collections & Archives at the University of Liverpool Library. The blog cited C.F. Hopkinson in a discussion about land-based Cunard employees who served during World War I. The Cunard Line Staff Magazine was the source for this information, and the blog emphasized the importance of staff magazines in an archival collection, as company records rarely contain information about individual employees. The little information they presented on C.F. Hopkinson confirmed that he was an artist, even though employed as an accountant by Cunard. Moreover, the blog post elicited a response and additional information from C.F. Hopkinson’s daughter. 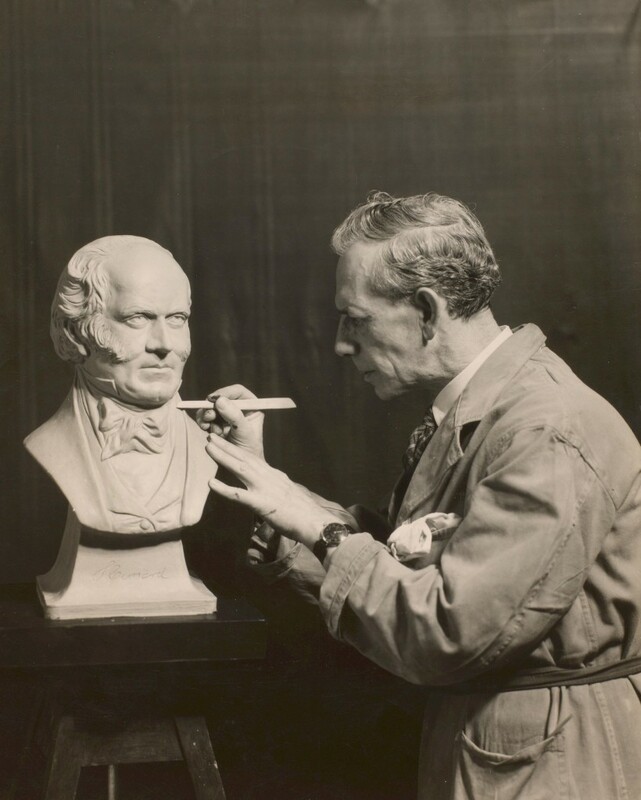 Charles Francis Hopkinson working on bust of Samuel Cunard. While there’s nothing earthshaking about the tidbit of information I found, it’s always fun to have a bit of serendipity in one’s work and to be reminded of what a small world we live in–and of the power of blogs!